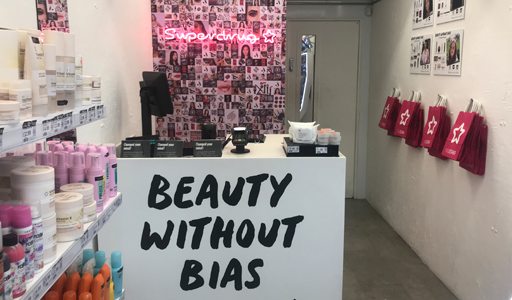 As part of Superdrug's campaign for accessible, inclusive beauty, the high street chain has opened a Beauty Without Bias make-up only pop-up shop in Box Park, Shoreditch. Brands showcased in the pop up shop include vegan brand B.’s makeup and accessories, the social media savvy brand Revolution, Nip + Fab which was one of the biggest makeup launches of 2017, the original budget beauty brand MUA and international makeup brand ELF direct from NYC. The pop-up shop will strip away traditional point of sale and instead showcase edits chosen by social media influencers which echo the ethos of the Beauty Without Bias campaign. Gary Thomson (@ThePlasticBoy) is renowned for transforming the beauty industry without being categorised by his race or sexuality; Emily Davidson (@Fashineyesta) doesn’t allow her visual impairment to stop her from being an avid beauty lover; Naomi Oni (@TheNaomiOni) who has fought the stigma of facial scarring after an acid attack; and trans-activist Charlie Craggs (@Charlie_Craggs) who uses her manicurist skills to tackle transphobia. They have each chosen their top 10 edit which will feature in the shop. The shop will also feature a selection of Superdrug’s bestselling vegan products. Simon Comins, Superdrug Commercial Director comments: “We are delighted to be opening our second pop up shop of 2018 in Box Park this summer, the Beauty Without Bias shop showcases a selection of our exclusive makeup brands in one little shop. To celebrate the opening we’ve worked with a group of people we’ve long admired and asked them to choose their favourite products from the collections in store. The shop will remain open until 10th September. Remember skinny brows and zig-zag partings?